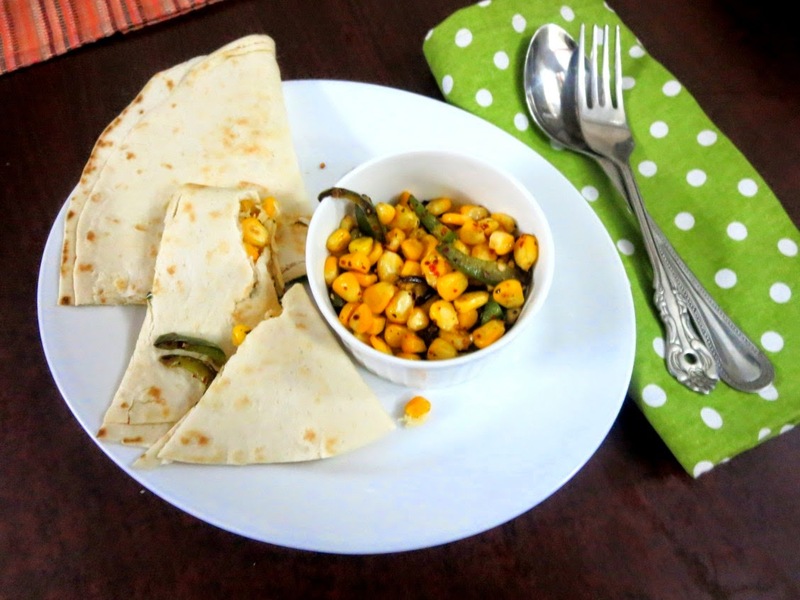 For the second day of Easy Tiffins, I have something that was done in just about 10 - 15 mins of time and I really feel nothing can beat this, if you have all the necessary ingredients handy. The ingredients that have gone into this are Konda's favorite, plus it was quesadilla, so I was sure she was going to love it. She has sports practice and comes home tired, however doesn't want to eat the regular dishes. I really didn't have an idea of what to make, when she suddenly said she was so hungry that she was going to faint! All that while the three of them were playing chess, which is the latest addiction with them. Infact couple of days back, they pulled me to play with them and the game went through late night as all three of them wanted a chance. The surprise part was Konda beating me at the game and it was most unexpected. If I wasn't doing what I am doing now, I might have become a chess player. Or in my dreams I am sure. Anyway the game was keeping them occupied, and the moment it got over, she was so hungry that she said she couldn't even walk or talk. Well that only meant I had about 10 mins to whip up something and this was the quickest tiffin I could make. Sweet corns and Capsicums are always stocked. So is cheese. And all I had to do is warm up the tortillas and get everything on it! 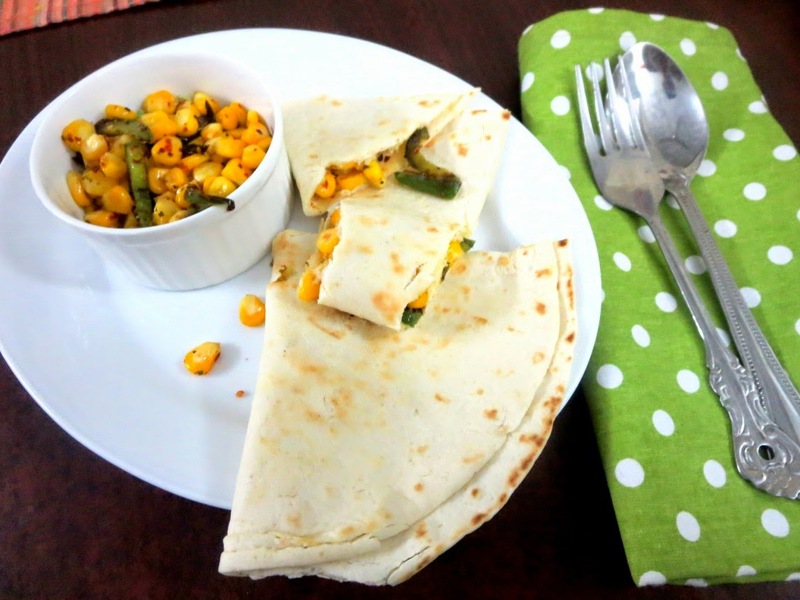 Quesadillas are really such a quick and easy ones to make for your kids, if they are fond of cheese and corn. 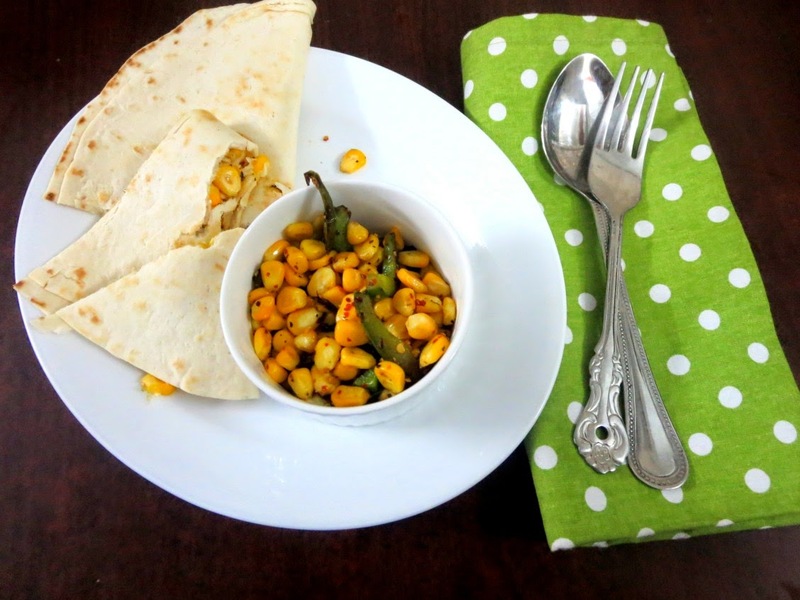 Blanch the sweet corn kernels for 1 min in MW. 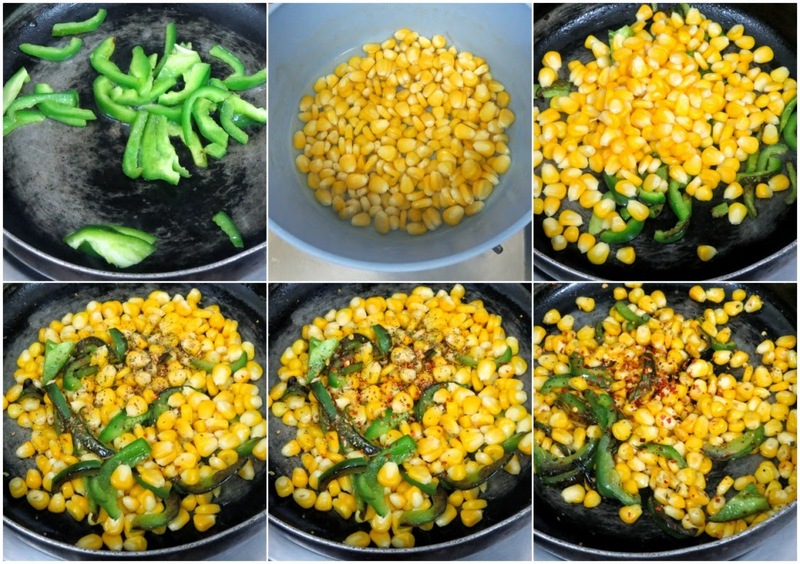 In a non stick pan heat the oil, saute the capsicum and corn for 5 - 7 mins. Sprinkle the seasoning, salt and chili flakes. Combine everything well. 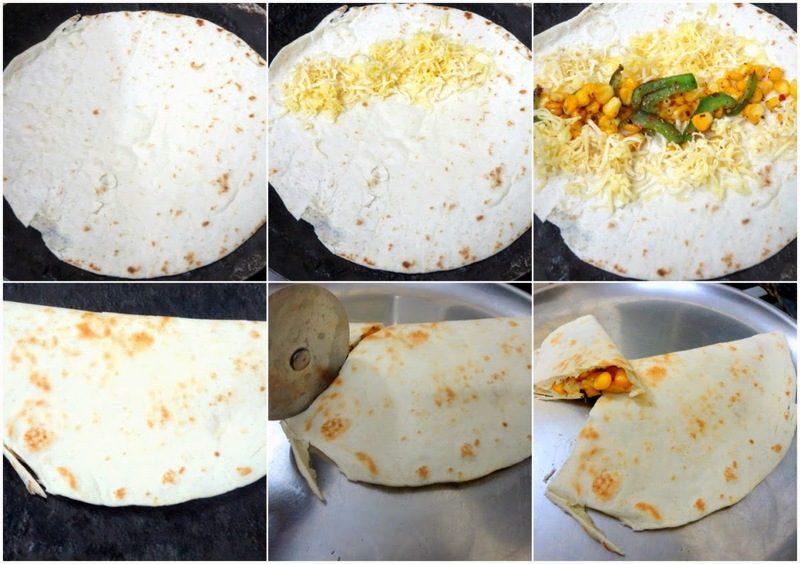 In a tawa, warm the tortillas on both the sides. On the top, place a layer of mixed grated cheese, the filling and another layer of cheeses. Flip one over the cheese and flip, cook again in sim. Serve right away when it is still warm. Vary as per what the kids prefer, with onions and tomatoes as well.